Have you been following our journey of Early Education? If you have, then you are probably familiar with BrillKids, which we have used with Isabella to learn sight words and reading, math and now music! You can read more about BrillKids Little Math here. 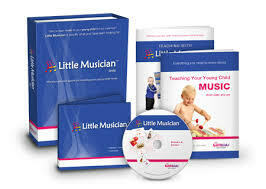 Have you thought about teaching your babies music? What would you show them? Notes? Musical Instruments? Composers? Technique? How can you teach them all of that in just five minutes a day? In just five minutes a day, you can give your child a music lesson that will teach them how to sight-read music, rhythm, musical instruments, classical music, composers, solfege, and even the musical keyboard. We started using this program when Isabella was about 2 1/2 years old after she began using Soft Mozart, which you can read about here. She loved it, and in conjunction with Soft Mozart, it was magical! We love BrillKids and have used their programs for years now. I had first purchased Little Math which I have already reviewed and Little Reader which I will discuss soon. We waited such a long time for Little Musician, and the wait was well worth it. It is such a fantastic program, so highly developed and so comprehensive. Both of my children LOVE BrillKids especially Little Musician. While Isabella started using it at around 2 1/2, Anthony began using it at about one year old. Both children never get tired of it and love it so much. Although, Isabella has finished all of her curricula for it she doesn’t mind watching along with her brother. It is always engaging and teaches in such a fun and interactive way. They learn to sing in solfege (do, re, mi, etc. ), which helps develop your child’s voice. It also helps develop a good ear; your child will learn to recognize notes and chords, and improve their sense of sound and pitch. It helps teach how to sight-read music, by showing them how to identify notes that are written on the musical staff, allowing them to sight-read written notes and simple melodies. They learn a sense of rhythm by using clap along which is my sons favorite part of the lesson; your child will start to develop the ability to move in rhythm to the music. They also learn about musical instruments (string, brass, woodwind, keyboard, and percussion), they get to hear and see the musical instrument as well as the instrument being played. Another thing they learn that I love is that they get to learn about classical music and composers. They share a composer and play a sample of their music as well as a unique composition in each lesson. They also learn about the keyboard and gain familiarity with the musical keyboard and how each key corresponds with the different pitches and solfege syllables. There are beautiful lessons which vary daily and teach a comprehensive lesson each day in only five minutes; I have not seen anything that can compare to this program yet. It is only available on the computer as is Little Math; it is also customizable which I love because I was able to use Soft Mozart icons for it which helped even more in teaching the musical notes, solfege and helped with actually playing the piano. I like that all of the BrillKids programs grow with your child. You can create and modify lessons and make it personal. I recommend this product, as well as all BrillKids products as I have seen my children learn and grow so much from using them. Both of my children have developed, excelled and built a deep appreciation for music. Check out their website site yourself, take advantage of the free trials and see how you and your child like it. I am an affiliate for BrillKids, so if you use my link, I will receive a small commission if you make a purchase. However, you can also save 10% off with the coupon code BKAFF30533.